Slogan of the Democratic Party's States Rights coalition ("Dixiecrats") that opposed racial integration and fought to preserve Jim Crow laws and racial segregation. As an influential Louisiana politician and bond attorney for the $56.7 million Lake Pontchartrain Causeway that connected the predominantly white enclaves of Jefferson and St. Tammany Parishes in Louisiana,* Frank Burton Ellis may have anticipated the role that the new toll bridge would play in facilitating white flight out of New Orleans during the tumultuous period of public school integration in the 1960s. He strongly opposed desegregation. *Parishes in Louisiana are equivalent to counties in all other states. In 1956, the initial two-lane Causeway was opened at a cost of $30.7 million, and in 1969 a second, parallel two-lane span opened at a cost of $26 million.12 Although the bridge is usually touted as connecting the New Orleans metropolitan area with the Northshore, its southern terminus is not the city of New Orleans itself, but rather the predominately white suburb of Metairie in neighboring Jefferson Parish. Many prominent and influential families who conducted their social, professional and business affairs in New Orleans also had residences in Covington or Mandeville while still maintaining homes in New Orleans. The Causeway was a welcome time-saver for these families. Contributing to the loss of population from New Orleans – aside from the unrest that accompanied desegregation of the public schools and public accommodations – was the loss of manufacturing jobs, which changed the direction of the economy toward the service industry, particularly tourism. Additional plans for other biomedical projects will continue to further the growth of St. Tammany Parish. For example, by late 2010, a multi-million dollar forensic science center is projected to be opened on 40 acres just south of a site where the parish is planning a "university square" campus for colleges and an advanced-studies high school.40,41 A temporary DNA laboratory that opened in September 2007 is already receiving national and international accreditation from the American Society of Crime Laboratory Directors.42 When it is completed, the laboratory should add many new jobs to the St. Tammany workforce. In the early 1960s, white migration to suburban parishes represented only one of several major concerns in New Orleans. During this era, the Port of New Orleans was in decline from the competition of newer, more technologically advanced port cities.43 The Port and Dock Board attempted a major overhaul of infrastructure and spent more than $128 million on expansion and construction. It also convinced the city, state, and federal governments to dig the Mississippi River-Gulf Outlet (MR-GO) at a cost of an additional $120 million to create a direct route from the Gulf of Mexico to New Orleans. In Louisiana, a 1954 state law restricted federal renewal aid more stringently than in any other state. It was not until 1968 that the state legislature took action that would permit federal urban renewal aid in Louisiana cities,50 and in 1969 voters in Orleans Parish endorsed a plan that would allow urban renewal funds for the city51. In 2007, New Orleans was ranked as the city with the highest crime rates in the United States, and in 2008 it was named the murder capital of the nation.92,93 Clearly, the problems that plague New Orleans continue to frustrate those who have been perennially disfranchised as well as those who are dedicated to just and rational social reforms. Meanwhile in 2008, increased traffic on the Northshore around Mandeville has prompted the Causeway Commission to widen roads in this area,94 and the commission is considering the construction of a third span across the lake.12 Inherent in these developments are continued demographic and economic consequences for the future of New Orleans. Political, genealogical and demographic data was assembled from sources considered to be reliable. Only a small sampling of the large amount of information available is cited. Please address corrections to the author at tulanelink@aol.com. "Amite City, Louisiana," Wikipedia, the Free Encyclopedia, http://en.wikipedia.org/wiki/Amite,_Louisiana, accessed 12/07/2008. Submitted by Edie McKinney Talley, "Ellis Cemetery: Tangipahoa Parish, La.," LAGenWeb Archives, http://files.usgwarchives.org/la/tangipahoa/cemeteries/ellis.txt, accessed 06/24/2008. Inventory by Luana Henderson, "Appendix - Ellis Family Tree," Buck-Ellis Family Papers (Mss. 4820), Louisiana State University Libraries, pp. 24-25, http://www.lib.lsu.edu/special/findaid/4820.pdf, accessed 07/06/2008. "Index to Politicians: Ellis," Political Graveyard, http://political graveyard.com/bio/ellis.html, accessed 11/28/2008. "Judge Ellis Dies; Burial Set at Amite," The Morning Advocate, Baton Rouge, LA, November 5, 1969. Source: State Library of Louisiana, Baton Rouge, Louisiana, accessed 12/23/2008. "Ellis, Frank Burton," Judges of the United States Courts, http://www.fjc.gov/servlet/tGetInfo?jid=701, accessed 08/28/2008. Todd Valois, "7 Generations of Family Found Calling in the Law," The Times-Picayune, New Orleans, July 7, 1992, Picayune Section, p. 10H1. Carl Bernofsky, "Judge Frank Burton Ellis (1907-1969): A Brief Biography and Selective Genealogy," Tulanelink.com, http://www.tulanelink.com/tulanelink/judgefrankellis_08a.htm, accessed 12/28/2008. "St. Tammany Parish, Louisiana," Wikipedia, the Free Encyclopedia, http://en.wikipedia.org/wiki/St._Tammany_Parish, accessed 12/11/2008. "Thomas Cargill Warner Ellis III," Death Notices & Guest Books, nola.com, http://www.legacy.com/NOLA/DeathNotices.asp?Page=Notice&PersonID=114484801. accessed 08/16/2008. "Welcome to Louisiana's I-12 Retirement District," Southeastern Louisiana University Business Center, http://www.lai-12retirement.org/, accessed 12/12/2008. "Lake Ponchartrain Causeway," Wikipedia, the Free Encyclopedia, http://en.wikipedia.org/wiki/Lake_Pontchartrain_Causeway, accessed 11/23/2008. "Bernard de Marigny," Wikipedia, the Free Encyclopedia, http://en.wikipedia.org/wiki/Bernard_de_Marigny, accessed 12/10/2008. "Welcome to the City of Mandeville," Mandeville, Louisiana, http://www.cityofmandeville.org See: Inside Mandeville - Mandeville Past and Present - Past, accessed 12/07/2008. "Mandeville on the Lake," Welcome to the City of Mandeville, Mandeville, Louisiana, http://www.cityofmandeville.org/view.cgi?action=view&page=626&i=102, accessed 12/10/2008. "Moments in Time: Exploring the History of the Lake Pontchartrain Basis," Lessons on the Lake, http://pubs.usgs.gov/of/1998/of98-805/lessons/chpt10/index.htm, accessed 12/22/2008. "A Little Covington History," City of Covington, Louisiana, http://www.cityofcovingtonla.com/10hist1.html, accessed 12/26/2008. "1895~Cape Charles Ferry/Steamboat," From: New Orleans, Louisiana History~~Lake Pontchartrain, http://stphilipneri.org/teacher/pontchartrain/content.php?type=1&id=299, accessed 12/07/2008. Richard F. Weingroff, "The Battles of New Orleans - Vieux Carre Riverfront Expressway (I-310)," Highway History, U.S. Department of Transportation Federal Highway Administration, http://www.fhwa.dot.gov/infrastructure/neworleans.cfm, accessed 01/06/2009. Carl A. Brasseaux and James D. Wilson, Jr., Editors, "A Dictionary of Louisiana Biography, Ten-Year Supplement 1988-1998, Vol. I, The Louisiana Historical Association in cooperation with the Center for Louisiana Studies of the University of Southwestern Louisiana (1999), pp. 78-79, accessed 01/07/2009. "Louisiana Haymaker," Time Magazine, April 14, 1961, http://www.time.com/time/printout/0,8816,872246,00.html, accessed 11/21/2008. "1952 Presidential General Election Results - Louisiana," USA Election Polls, http://www.uselectionatlas.org/RESULTS/state.php?fips=22&year=1952&f=0&off=0&elect=0, accessed 12/21/2008. "1960 Presidential General Election Results - Louisiana," USA Election Polls, http://www.uselectionatlas.org/RESULTS/state.php?fips=22&year=1960&f=0&off=0&elect=0, accessed 12/21/2008. "Lawyer for Defense: Frank Burton Ellis," The New York Times, New York, NY, January 24, 1961, http://select.nytimes.com/mem/archive/pdf?res=FB0913FB3C5D1B728DDDAD0A94D9405B818AF1D3, accessed 12/14/2008. Nicholas H. Carter, Contesting Cultural Explanations of Poverty: Migration and Economic Development in New Orleans, 1965-1980, [PDF], A thesis submitted in partial fulfillment for the degree of Bachelor of Arts with Honors in History, Williams College, Williamstown, Massachusetts, April 16, 2007, 96 pp., p. 90. "Interstate 10 in Louisiana," Wikipedia, the Free Encyclopedia, http://en.wikipedia.org/wiki/Interstate_10_in_Louisiana, accessed 01/01/2009. "Interstate 12," History, Wikipedia, the Free Encyclopedia, http://en.wikipedia.org/wiki/Interstate_12, accessed 01/01/2009. Compiled and edited by Richard L. Forstall, "Louisiana: Population of Counties by Decennial Census: 1900-1990," Population Division, U.S. Bureau of the Census, Washington, DC 20233, http://www.census.gov/population/cencounts/la190090.txt, accessed 11/21/2008. "Orleans Parish: People & Household Characteristics," Greater New Orleans Community Data Center, http://www.gnocdc.org/orleans/people.html, accessed 12/02/2008. Kevin Fox Gotham, "Tourism Gentrification: The Case of New Orleans' Vieux Carre (French Quarter)," Urban Studies, Vol. 42, No. 7, 1099-1121, June 2005, http://www.tulane.edu/~kgotham/TourismGentrification.pdf, accessed 12/08/2008. "2000 Population of Jefferson Parish, Louisiana," The Parish of Jefferson Census Information, http://www.jeffparish.net/index.cfm?DocID=1223, accessed 12/02/2008. 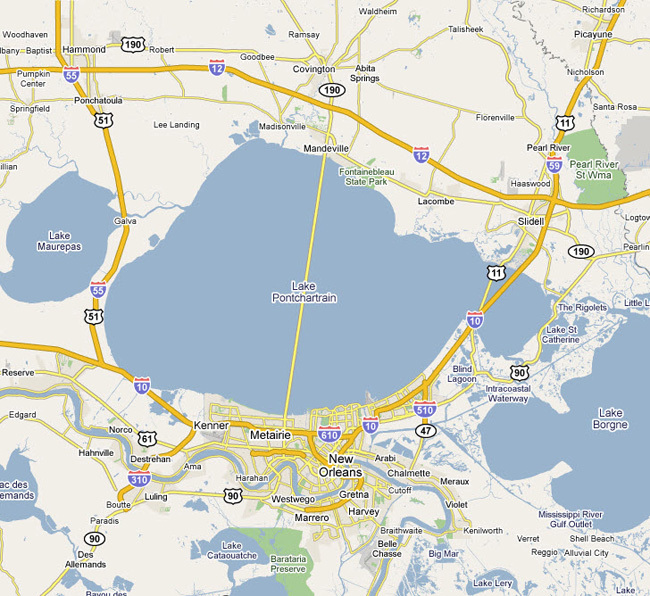 "St. Tammany Parish, Louisiana," Wikipedia, the Free Encyclopedia, http://en.wikipedia.org/wiki/St_Tammany_Parish. accessed 12/01/2008. "Tangipahoa Parish: People & Household Characteristics," Greater New Orleans Community Data Center, http://www.gnocdc.org/tangipahoa/people.html, accessed 12/02/2008. "Mandeville, Louisiana," Wikipedia, the Free Encyclopedia, http://en.wikipedia.org/wiki/Mandeville,_Louisiana, accessed 12/10/ 2008. "History," Tulane National Primate Research Center, http://www.tnprc.tulane.edu/history.html, accessed 12/12/2008. W. Richard Dukelow and Leo A. Whitehair, "A Brief Historyof the Regional Primate Research Centers," Comparative Pathology Bulletin, 27(3): 1-2, 1995, Primate Info. Net, http://pin.primate.wisc.edu/research/dukelow.html, accessed 12/12/2008. Keith Brannon, "New $27.5 Million Tulane University Biosafety Lab Will Expand Research, Create Jobs," Tulane University News Release, December 5, 2008, http://tulane.edu/news/releases/pr_120508.cfm, accessed 12/05/2008. Benjamin Alexander-Bloch, "Primate Center Unveils Biosafety Lab - Facility Part of U.S. Plan to Fight, Plan for Bioterror Events," The Times-Picayune, New Orleans, December 6, 2008, National, p. 01. See also: John Pope, "Tulane to Unveil Biosafety Facility- Regional Lab to Study Infectious Diseases," The Times-Picayune, New Orleans, November 21, 2008, Metor, p. 04. Benjamin Alexander-Bloch, "Primate Center Decision Delayed - Neighbors Oppose Zoning Change," The Times-Picayune, New Orleans, August 5, 2010, Metro, p. 01. See also: Benjamin Alexander-Bloch, "Parish Allows Go-Ahead On Levees - Work Will Improve Them South of Slidell," The Times-Picayune, New Orleans, August 6, 2010, Metro, p. 01. Charlie Chapple, "Home, College Project Moves Forward - University Square Could Start in Spring," The Times-Picayune, New Orleans, June 14, 2008, National, p. 01. "Week in Review," The Times-Picayune, New Orleans, June 22, 2008, Slidell Picayune Section, p. 01. Charlie Chapple, "Unified Forensic Center Coming Soon - Facility Should Be Finished in 2010," The Times-Picayune, New Orleans, December 13, 2008, National, p. 01. Nicholas H. Carter, Contesting Cultural Explanations of Poverty: Migration and Economic Development in New Orleans, 1965-1980, [PDF], A thesis submitted in partial fulfillment for the degree of Bachelor of Arts with Honors in History, Williams College, Williamstown, Massachusetts, April 16, 2007, 96 pp., p. 17. Sheila Grissett, "MR-GO Blamed for Levee Failures - Scientist Says Channel Exacerbated Flooding," The Times-Picayune, New Orleans, December 19, 2008, Metro p. 04. Bob Warren, "MR-GO Closure Gets Go-ahead - Job to Finish Midway through Storm Season," The Times Picayune, New Orleans, December 17, 2008, Metro, p. 01. Nicholas H. Carter, Contesting Cultural Explanations of Poverty: Migration and Economic Development in New Orleans, 1965-1980, [PDF], A thesis submitted in partial fulfillment for the degree of Bachelor of Arts with Honors in History, Williams College, Williamstown, Massachusetts, April 16, 2007, 96 pp., p. 25. Nick Marinello, "The Diaspora," Tulanian, Summer 2006, http:www2.tulane.edu/article_news_details.cfm?ArticleID=6750, accessed 11/01/2006. J. Mark Souther, "Into the Big League," Journal Urban History, Vol. 29, No. 6, 694-725 (2003), Sage Journals Online, http://juh.sagepub.com/cgi/content/abstract/29/6/694, accessed 12/05/2008. Matt Scallan and John Pope, "Most of City's Workers Fall into Service Jobs - Orleans Poverty Rate Among Worst in U.S.," The Times Picayune, New Orleans, November 20, 2001, National, p.01. Coleman Warner, "Reconstruction: First School Integration Test Came in 1870s," The Times-Picayune, New Orleans, June 15, 1993, National, p. A16. Alcee Fortier, Louisiana Studies: Literature, Customs and Dialects, History and Education, New Orleans, LA, F.F. Hansell & Bro. (1894), pp. 267-268. John Smith Kendall, History of New Orleans, Chicago and New York, The Lewis Publishers (1922), 605 pp., p. 531. Beatrice M. Field, Mary S. Ingraham, and Amanda R. Rittenhouse, Potpourri: An Assortment of Tulane's People and Places, Aug. 1983, (Additional research, edits and compilation of material, Aug. 2002), 166 pp., p. 38, http://www.tulane.edu/~alumni/potpourri/Potpourri_web.pdf, accessed 01/12/2008. Henry Rightor, Editor, Standard History of New Orleans, Louisiana, Chicago, IL: The Lewis Publishing Company (1900) 743 pp., pp. 240-241. Paul Zielbauer, "Apologizes for Slave-Era Ads," Race and History.com, http://raceandhistory.com/historicalviews/slaveera.htm, accessed 11/20/2006. John P. Dyer, Tulane: The Biography of a University 1834-1965, New York and London, Harper & Row Publishers (1966) 370 pp., p. 12. William Julius Wilson, The Truly Disadvantaged: The Inner City, The Underclass, and Public Policy, Chicago, IL, University of Chicago Press (1990) 261 pp. "Brown vs.The Board of Education of Topeka," Wikipedia, the Free Encyclopedia, (See: Note #1), http://en.wikipedia.org/wiki/Brown_v._Board_of_Education, accessed 12/05/2008. "J. Skelly Wright," Wikipedia, the Free Encyclopedia, http://en.wikipedia.org/wiki/J._Skelly_Wright, accessed 12/08/2008. Gwendolyn Thompkins, "Today's College Campuses are Diverse but Fragmented," The Times-Picayune, New Orleans, November 14, 1993, National, p. A26. Clarence L. Mohr and Joseph E. Gordon, Tulane: The Emergence of a Modern University 1945-1980, Baton Rouge, LA, Louisiana State University Press (2001) 504 pp., p. 138. "Morial Exhibit at Amistad," Tulane University NewWave, July 8, 2008, http://tulane.edu/news/newwave/newssplash_0708.cfm, accessed 07/08/2008. Southern Institute for Education and Research, "A House Divided Teaching Guide, 6, City Hall 1963," http://www.southerninstitute.info/civil_rights_education/divided10.html, accessed 12/05/2008. Carl Bernofsky, "A Tradition of Discrimination," Tulanelink.com, http://www.tulanelink.com/tulanelink/racist_legacy_01a.htm, accessed 12/28/2008. Cheryl V. Cunningham, The Desegregation of Tulane University, A thesis submitted in partial fulfillment for the degree of Master of Arts in History, University of New Orleans, New Orleans, Louisiana, December, 1982, 118 pp., Tulanelink.com, http://www.tulanelink.com/tulanelink/desegregation_box.htm, accessed 01/05/2009. Clarence L. Mohr and Joseph E. Gordon, Tulane: The Emergence of a Modern University 1945-1980, Baton Rouge, LA, Louisiana State University Press (2001) 504 pp., p. 240. "Ruby Bridges and Integration of New Orleans Schools," American Experience Program, PBS, Page created December 1, 2006, http://www.pbs.org/wgbh/amex/neworleans/peopleevents/e_integration.html, accessed 12/29/2007. See also: Kit Senter, "Students at first integrated school faced hatred," The Times-Picayune, New Orleans, January 24, 2009, Metro, p. 6. See also: The McDonogh Three; In 1960, three first-grade girls integrated McDonogh No. 19. ..." The Times-Picayune, New Orleans, May 16, 2004, National, p. 19. Nicholas H. Carter, Contesting Cultural Explanations of Poverty: Migration and Economic Development in New Orleans, 1965-1980, [PDF], A thesis submitted in partial fulfillment for the degree of Bachelor of Arts with Honors in History, Williams College, Williamstown, Massachusetts, April 16, 2007, 96 pp., p. 13. Chris Kirkham, "Civil Rights Struggle Lives on in La. 's Public Schools - Segregation Rising since Mid-1980s," The Times-Picayune, New Orleans, July 29, 2007, National, p. 01. Brian Thevenot, "Unintended Consequences - By the 1970s, Real Integration Had Come to New Orleans Public Schools, but as Middle-class Families  both Black and White  Fled, the Schools and the City Suffered," The Times-Picayune, New Orleans, May 17, 2004, National, p. 01. Brian Thevenot, "From Resistance to Acceptance - New Orleans Suburbs, Aided by White Flight, Fought Hardest against Integration. But now, some Suburban School Districts Are Exemplars of Successful Integration." The Times-Picayune, New Orleans, May 19, 2004, National, p. 01. "Metairie, Louisiana," Wikipedia, the Free Encyclopedia, http://en.wikipedia.org/wiki/Metairie,_Louisiana, accessed 12/02/2008. Camille Zubrinsky Charles, Chapter 3, "Can We Live Together? Racial Preferences and Neighborhood Outcomes," in: Xavier N. De Souza Briggs and William Julius Wilson, Editors, The Geography of Opportunity: Race and Housing Choice in Metropolitan America, Baltimore, MD: Brookings Institution Press (2005), 353 pp., p. 54. "Covington, Louisiana," Wikipedia, the Free Encyclopedia, http://en.wikipedia.com/wiki/Covington,_Louisiana, accessed 12/16/2008. "Jefferson Parish: People & Household Characteristics," Greater New Orleans Community Data Center, http://www.gnocdc.org/jefferson/people.html, accessed 12/02/2008. "St. Tammany Parish: People & Household Characteristics," Greater New Orleans Community Data Center, http://www.gnocdc.org/st_tammany/people.html, accessed 12/02/2008. Jenny Hurwitz, "Jeff Pupils Will Be Making History - Desegregation Plan Brings Big Changes," The Times-Picayune, New Orleans, August 9, 2008, National, p. 01. Jenny Hurwitz, "Judge Rejects Magnet School Plan - Elementary School Conversion Opposed," The Times-Picayune, New Orleans, January 7, 2009, National, p. 01. "Civil Rights Acts of 1964," Wikipedia, the Free Encyclopedia, http://en.wikipedia.org/wiki/Civil_Rights_Act_of_1964, accessed 12/05/2008. Edmund W. Lewis, "A River Runs through It,"The Louisiana Weekly, New Orleans, August 21-27, 2006, p. 4. Jennifer Evans, "SCLC Chief Blasts Racism in New Orleans - Civil Rights Group Wraps up Convention," The Times-Picayune, New Orleans, July 31, 2008, Metro, p. 02. (37) Kathleen Morgan, Scott Morgan, and. Rachel Boba, "2008 City Crime Rankings (Continued)," and "An Important Note about New Orleans," in: City Crime Rankings 2008-2009, CQ Press, Washington, D.C., (2008), 417 pp., http://www.cqpress.com/product/City-Crime-Rankings-2008.htm, accessed 01/12/2009. Brendan McCarthy, "Overall N.O. Crime Rate Leads U.S., Study Says - Not My Fault, Riley Replies," The Times-Picayune, New Orleans, November 25, 2008, Metro, p. 01. Christine Harvey, "Wider Causeway Boulevard on Way - New Lane on Each Side Should Be Done by End of Year," The Times-Picayune, New Orleans, January 7, 2009, National, p. 01.